Let’s take a look at how the valves of the heart operate to direct a one-way flow of blood from the atria to the ventricles to the arteries. The AV valves are normally open. When a ventricle contracts, however, the pressure of the blood forces the cusps of an AV valve to meet and close. The force of the blood is often likened to a strong wind that can cause an umbrella to turn inside out. However, the papillary muscles contract, causing the chordae tendineae to tighten and pull on the valve and thus preventing it from reverting into an atrium. A semilunar valve is normally closed-the contraction of a ventricle opens it. Then, when the ventricle relaxes, the blood in the artery pushes backward, closing the valve. Like mechanical valves, the heart valves are sometimes leaky; they don’t close properly, and there is a backflow of blood. When a person has rheumatic fever, a bacterial infection that began in the throat has spread throughout the body. The bacteria attack connective tissue in the heart valves as well as other organs. Most often, the bicuspid valve and the aortic semilunar valve become leaky. In that case, the valve can be replaced with a synthetic valve or one taken from a pig’s heart. The blood may clot in an unbroken blood vessel, particularly if plaque is present. Thromboembolism is present when a blood clot breaks away from its place of origin and is carried to a new location. Thromboembolism leads to heart attacks when the embolus blocks a coronary artery and a portion of the heart dies due to lack of oxygen. Dead tissue is called an infarct, and therefore, a heart attack is termed a myocardial infarction. One possible way to prevent clots from forming is to take aspirin. Aspirin reduces the stickiness of platelets and thereby lowers the probability that clots will form. The dosage should remain limited because long-term aspirin use might have harmful effects, including bleeding in the brain. Surgical Procedures Two surgical procedures are associated with occluded coronary arteries. In balloon angioplasty, a plastic tube is threaded into an artery of an arm or leg and is guided through a major blood vessel toward the heart. 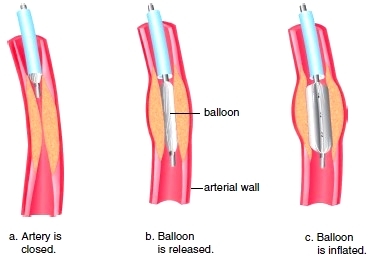 Once the tube reaches a blockage, a balloon attached to the end of the tube can be inflated to break up the clot or to open up a vessel clogged with plaque (Fig. 12.5). In some cases, a small metalmesh cylinder called a vascular stent is inserted into a blood vessel during balloon angioplasty. The stent holds the vessel open and decreases the risk of future occlusion. In a coronary bypass operation, a portion of a blood vessel from another part of the body, such as a large vein in the leg, is sutured from the aorta to the coronary artery, past the point of obstruction. This procedure allows blood to flow normally again from the aorta to the heart. Figure 12.6 shows a triple bypass in which three blood vessels have been used to allow blood to flow freely from the aorta to cardiac muscle by way of the coronary artery. Cardiac muscle fibers and the other types of cells in the wall of the heart are not nourished by the blood in the chambers; diffusion of oxygen and nutrients from this blood to all the cells that make up the heart would be too slow. Instead, these cells receive nutrients and rid themselves of wastes at capillaries embedded in the heart wall. Two coronary arteries, termed the left and right coronary arteries, branch from the aorta just beyond the aortic semilunar valve (Fig. 12.4). Each of these arteries branches and then rebranches, until the heart is encircled by small arterial blood vessels. Some of these join so that there are several routes to reach any particular capillary bed in the heart. Alternate routes are helpful if an obstruction should occur along the path of blood reaching cardiac muscle cells. 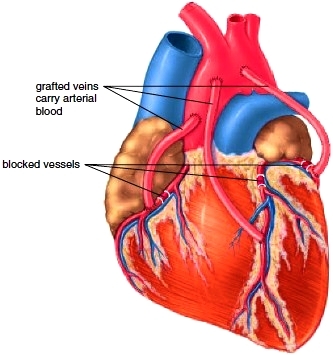 After blood has passed through cardiac capillaries, it is taken up by vessels that join to form veins. The coronary veins are specifically called cardiac veins. The cardiac veins enter a coronary sinus, which is essentially a thin-walled vein. The coronary sinus enters the right ventricle. Heart diseases are especially associated with atherosclerosis, a degenerative disorder of arterial walls. First, soft masses of fatty materials, particularly cholesterol, accumulate in the arterial wall. Further changes result in plaque, protrusions that interfere with blood flow. If the coronary artery is partially occluded (blocked) by atherosclerosis, the individual may suffer from ischemic heart disease. Although enough oxygen may normally reach the heart, the person experiences insufficiency during exercise or stress. This may lead to angina pectoris, chest pain that is often accompanied by a radiating pain in the left arm. Figure 12.4 Anterior view of exterior heart anatomy. a. The great vessels (venae cavae, pulmonary trunk, pulmonary arteries, and aorta) are attached to the base of the heart. The right ventricle forms most of the anterior surface of the heart, and the left ventricle forms most of the posterior surface. b. 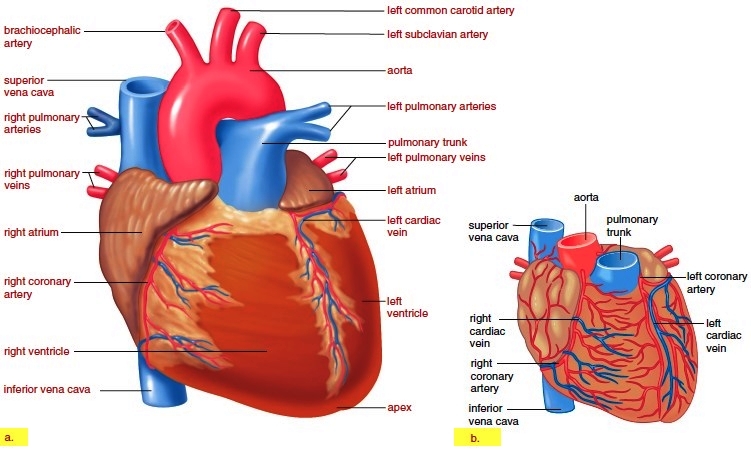 The coronary arteries and cardiac veins pervade cardiac muscle. The coronary arteries bring oxygen and nutrients to cardiac cells, which derive no benefit from the blood coursing through the heart. Figure 12.5 Balloon angioplasty. As described in the text, a balloon inserted in an artery can be inflated to open up a clogged coronary blood vessel. Figure 12.6 Coronary bypass surgery. During this operation, the surgeon grafts segments of another vessel between the aorta and the coronary vessels, bypassing areas of blockage.